All things now went well, with hope always of becoming still better; and Sam was as busy and as full of delight as even a hobbit could wish. Nothing for him mattered that whole year, except for some vague anxiety about his master. 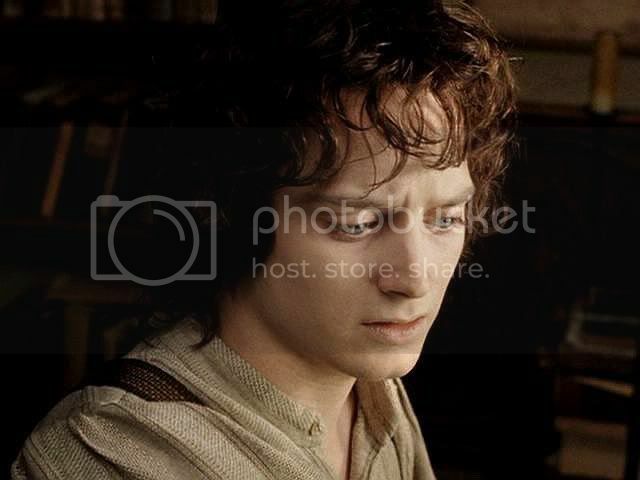 Frodo dropped quietly out of all the doings of the Shire, and Sam was pained to notice how little honour he had in his own country. 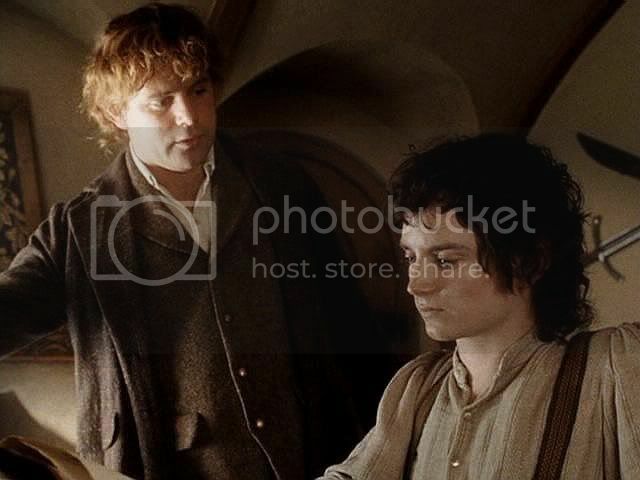 Few people knew or wanted to know about his deeds and adventures; their admiration and respect were given mostly to Mr. Meriadoc and Mr. Peregrin and (if Sam had known it) to himself. Also in the autumn there appeared a shadow of old troubles. One evening Sam came in the study and found his master looking very strange. He was very pale and his eyes seemed to see things far away. But then he got up, and the turn seemed to pass, and he was quite himself the next day. It was not until afterwards that Sam recalled that the date was October the sixth. Two years before on that day it was dark in the dell under Weathertop. 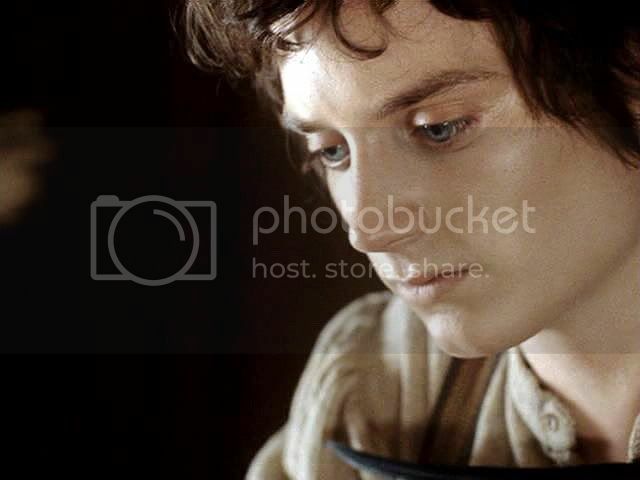 If I were forced to choose a favourite from all the Frodo fic I've read, Star of the Sea would be it. It’s exceptionally-well written and it touches me on many levels. It breaks my heart, but lifts my spirits. I first knew Pearl from afar when I was a newbie to LotR online fandom, admiring her well-written posts on TORc (Tolkien Online). Her writing was intelligent and full of Tolkien-knowledge, insight, and frothy wit. I found out only later she wrote fic, too. She has posted a number of fics under her pennames, mostly gen like this one, but some het and slash as well. Some of it is light, some serious. This story is a good example of what she does best in her serious fic: grounding a fic solidly in canon, then opening it up: wider, higher, deeper. Especially higher and deeper. In her best things I feel she lets me touch what is profound, other-worldly, and numinous in Tolkien’s sub-creation. Although this story is posted at a few fanfic archives, for my own reading pleasure (and yours if it appeals to you) I decided to post it here in full, so that it could appear with the screencaps I felt illuminated it. Pearl has given her permission for me to do so. Star of the Sea is a five-chapter story, but, since the chapters are fairly short, I have divided the fic into two larger parts. Chs. 1-3 appear below, immediately following the screencaps I have chosen for this section. As usual, all the caps have been tweaked for contrast, lighting and focus. Click HERE for Whiteling’s illustration for Star of the Sea, created May 2007. Summary: March 1421. As Frodo writes the Red Book and wrestles with painful memories, a vision comes to him in the depths of the night. Rating: PG-13 for violence and bad language by orcs in Chapter 3. 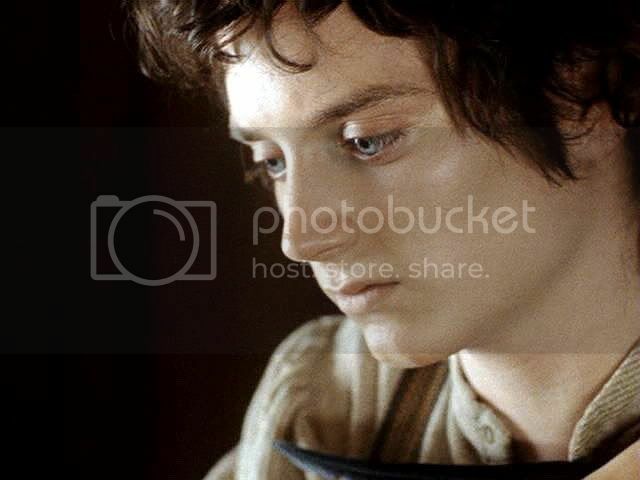 Posted at: Frodo's Harem Archives as 'Nienna', and at the Henneth Annun and West of the Moon archives under my other online name, 'Diamond of Long Cleeve'. Disclaimer: I don't own Tolkien's characters and am making no profit from posting this story on the internet. 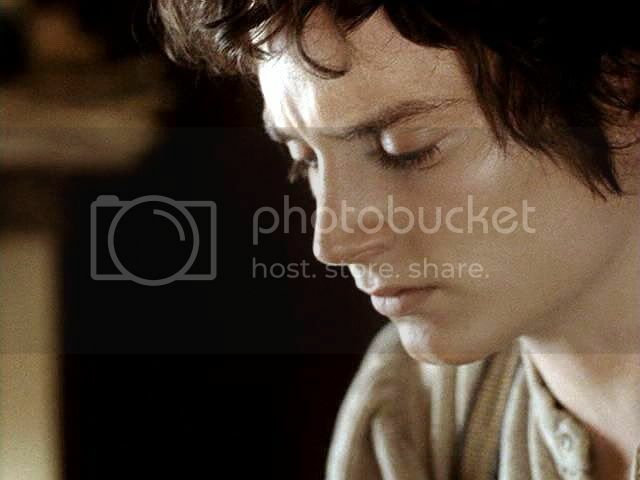 Frodo was ill again in March, but with a great effort he concealed it, for Sam had other things to think about. The first hints of spring. Bright sunlight gilded the naked trees. Fat catkins furred the hedges. Clusters of primroses and violets grew in banks upon The Hill. Already a faint green mist was appearing in the woodlands, and the slender branches of the willows around Bywater Pool were blushing red, hinting that the rich juice within was ready to burst forth into bud. Starlings and sparrows were chattering on the grass roof of Bag End. The sunlight streamed through the window of Frodo’s study, which faced south-west. Sunshine lay in broad gold bands across the creamy vellum pages. Frodo’s pen flew across them. In contrast to his uncle Bilbo’s somewhat erratic and spidery handwriting, his hand had always been firm, flowing and distinctive. Despite the minor disability to his right hand, he had schooled himself to recapture the quality of his former writing style; this he had achieved, as long as he remembered to take regular breaks and exercise the muscles in his fingers and hands, as Merry had recommended. It had been a merry Yule, and Frodo had been glad to forget about his book for a while, and to simply enjoy the company of his closest friends, as they laughed and drank and celebrated Yule together, and ate an abundance of food – including a brace of plump partridges brought by Rosie’s brother Nibs – and they had all toasted Sam and Rose and the baby to be born in the spring. In January Frodo had taken up the Red Book once more. His world had virtually shrunk to his study at Bag End, but he didn’t mind. Physically he might have been in his study, but mentally he was far away, traversing the mountains and plains of Middle-earth. He wrote with a fierce, all-consuming energy. The words fell easily from his pen, clear and rounded. His memories were stark and clear: there was so much to tell; so much, so much! His method was simple: he would write as much of the narrative as he could during the morning and afternoon, with appropriate breaks, and then in the evening he would add details like a poem or a song, or embellish a particular chapter with some extra details from Bilbo’s or Merry’s copious notes. Sometimes he would school himself not to return to the study before supper, and would spend a quiet evening with Sam and Rosie in the parlour by the fire, chatting to Sam while Rosie sewed bonnets and blankets and little smocks for the baby. Evening visits to The Green Dragon or The Ivy Bush had become rare: Sam could not be spared from the house for long now. The baby was due soon. 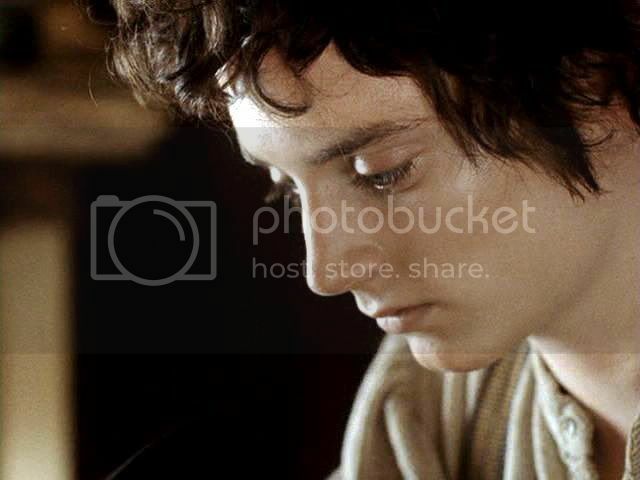 Frodo stopped writing and passed a hand through his hair. He caught sight of himself in the looking-glass across the room, and smiled wryly. His hair was still dark but there was the faintest suggestion of silver around his temples. He could see the weariness in his eyes. He sighed, and looked down at the new chapter he had just begun. Cirith Ungol, The Spider’s Pass. It was a curious thing but as chance would have it, the chronology of the events of the War coincided with the present time. He had begun to write the book in September 1420 and therefore found himself recording the events of two years previously, in September 1418, when he had started out on his quest. When he resumed writing, in January 1421, it didn't take long to record the quiet and watchful months spent by the Fellowship in Rivendell before they set out on their epic quest on 25 December 1418. He was able then to launch straight into their journey to the Misty Mountains and over Caradhras, which took place in January 1419. Now that it was March 1421, he found himself about to tell for posterity the darkest chapter of his story, two years ago, in March 1419. Yes, the darkest chapters, and the darkest hour of Sam’s life. He laid down his fountain pen, suddenly feeling faint and queasy. Instinctively he sought for the white gem on its chain round his neck, Arwen's bright jewel, which he never took off. The realisation of which date it was - 13th March - hit him like a dull, queasy blow. Damn it, Frodo thought, but he should have remembered, he should have been prepared. Two sicknesses in one year: March and October 1420. He should have realised that the sickness would come again. He had felt fine this morning. Now every time he looked at those words on the page, his vision swam. He found that he was breathing hard, and perspiring. The sweat dried on his forehead and chilled him. All morning Rosie had been busy in the kitchen, sorting out things in the larder and preparing the mid-day meal for herself and Mr Frodo. Sam was out all day on his forestry work: the last of his assignments in Bindbale Wood. He would be working closer to home now that the baby was almost due, and he had promised Mr Frodo that the Bag End garden would be his first priority during the summer. ‘Indeed it is,’ said Frodo. Rosie had grown used to the sound of Mr Frodo’s fountain pen, busily scratching in the study. He was so utterly absorbed in his work. It was such a long and mysterious book he was writing – he had promised her that it was a book for herself and Sam, that she could read it for herself one day. Rosie could read: Sam had taught her years ago. And with Mr Frodo’s help, she could read even better. She had even picked up a few of the Elvish words which her Sam seemed to know, and Mr Frodo knew best of all. Sam had told her a little about the Quest, and the War of the Ring – Mr Merry had told her more, him and Mr Pippin were full of wonderful tales about the lands of the South, where the King and Queen lived, and the golden-haired people of the plains rode their horses, and trees walked and talked in the woods, and the King’s white-circled city stood in the shadow of the Mountains. Wonderful tales out of the South. The local children – and many of their parents – liked to come and visit Bag End whenever Mr Merry and Mr Pippin were there, listening open-mouthed to these stories of tall Elves and Rangers and a huge battle before the gates of the King’s city. Folks had become more curious about the world since the four Travellers had come back. Shire-folk had a King now: maybe he would come and visit them one day. Mr Merry and Mr Pippin – and Sam – had been involved in great battles, seemingly, much bigger than the one in their own Shire, and that had been bad enough. Sam had hinted to Rosie that Mr Frodo had been in a war of his own, something to do with a magic ring belonging to Old Mr Bilbo. Sam had hesitated to say more at this point … and Rosie detected darker strands in the tapestry of the tales of the four Travellers. It was enough, she realised, to know that Mr Frodo had been wounded in some mysterious way during the War, and needed time to recover. So Sam said little, but his tenderness towards Mr Frodo said much. And Mr Frodo said even less, but smiled and joked with Sam and Rosie about the baby. And wrote his book. Which reminded Rosie. She would take him a glass of milk, just before she started lunch. ‘Mr Frodo?’ she called, as she opened the door of the study. Frodo glanced up. He had resumed writing. ‘Yes, Rose. 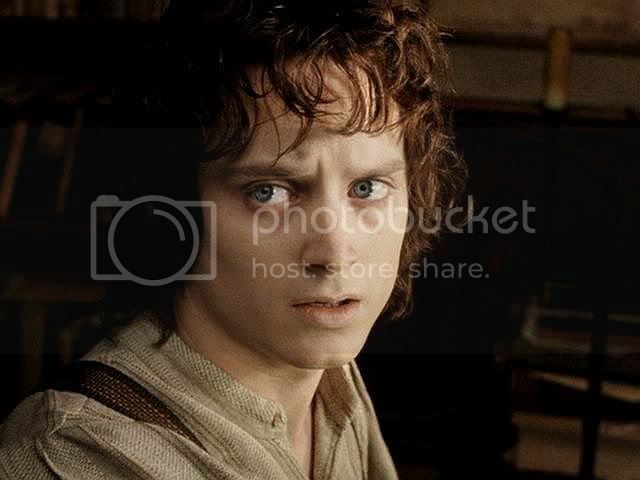 I’m fine,’ said Frodo, with an effort. He didn’t look fine. His face was white, and his brilliant blue eyes were staring at Rosie as if she weren't there: staring through her. ‘You’re looking awful pale,’ said Rosie anxiously. ‘Rosie,’ said Frodo gently. ‘No. All I need is rest. And a glass of milk,’ he added with a faint smile. ‘Thank you.’ He stood, and swayed slightly. ‘Mr Frodo,’ said Rosie. She came and took his arm. ‘Just help me to my room, Rose,’ said Frodo. ‘And then you must rest yourself after lunch. You need to conserve your energy for the child.’ He tried to smile at her, but it was obviously an effort: he looked strained. 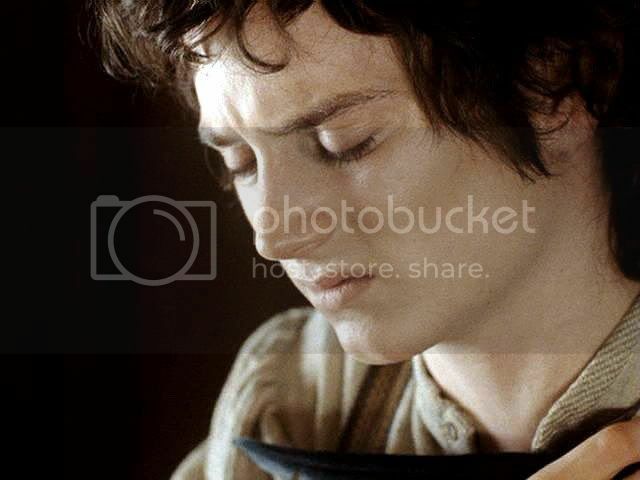 ‘No, dear Rosie.’ Frodo’s voice hinted at a laugh which sounded like a sob – and indeed he felt like laughing or crying. No gentlehobbit in the Four Farthings was looked after with more care than himself. But there were some things Sam and Rosie could not help him with. This strange March malady was one of them. Gently he closed the door of his bedroom behind him. Rosie looked after him, troubled. He’d had some funny turns like this when he and Sam had been staying at her dad’s, after the War and before she and Sam had married. It was something to do with the mysterious wound he had sustained … Sam said so little about it, and Mr Frodo nothing at all. It seemed to Rosie that Mr Frodo’s missing finger was the least of the problem. It was as if this wound, whatever it was, was on the inside of him, which couldn’t be reached. She returned to the kitchen, shaking her head. She put Mr Frodo’s meal in the oven to keep it warm, and sat down with her own lunch: a generous helping of bacon and mushrooms. Writing, writing, always writing. His face taut and absorbed and strangely, nervously animated. This was when he looked most alive these days, when he was writing, as if a fire lit him from within. His pen flew with a strange urgency, as if he was trying to get things down on paper as fast as he could before the memories faded. 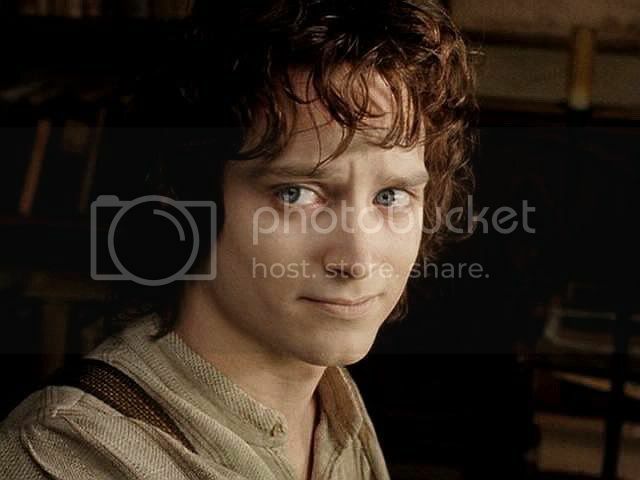 As she regularly brought him drink and cakes for refreshment, Rosie would glance at his thoughtful face framed by silky dark curls, and wonder for the thousandth time why so handsome a gentlehobbit had never married. And why, at times, an inner light seemed to illuminate his sensitive, finely drawn features. And why the deep quietness in him seemed to grow even deeper. A thrush was singing in the Bag End garden. The cascade of liquid notes poured forth in the evening light. In the West, the sky was flushed a soft and beautiful rose. Vivid pink streaks in the sky had dissolved into a soft flush of sunset, promising another beautiful spring day on the morrow. Sam and Rosie were sitting on the garden bench near Mr Frodo’s bedroom window, talking as softly as they could so as not to disturb him. His bedroom had once been Old Mr Bilbo’s: it was situated on the western side of Bag End, affording a fine view of the fields and woods stretching towards the White Downs just visible on the horizon. Sam was smoking a pipe and his left arm enfolded Rosie, who was wrapped in a shawl and snuggled close against him. The light was fast fading but it was such a glorious evening they had wanted to make the most of it while it lasted. ‘Not long now,’ said Rosie softly. ‘Aye,’ said Sam. And he moved his arm so that his strong, square hand came to rest tenderly and protectively on his wife’s swollen belly. Sam’s voice was rich and warm with pride, and something like reverence. ‘The kind which makes lads and lasses do the Springle-ring in the spring,’ chuckled Sam, citing an old Shire-joke. He nuzzled her neck and they both giggled, and then kissed, gently and lovingly. ‘He was a lot better by tonight,’ said Rose. ‘But you didn’t see him earlier, Sam. He was that pale.’ So pale, she thought, that his eyes seemed even more blue and bright. ‘He sayshe’s all right,’ said Rosie anxiously. It was true. She had left Frodo to sleep all afternoon, and had peeped in on him at several times. He had been sleeping as sweetly and soundly as a child. His face had lost the dreadful pallor she had seen earlier, and his cheeks were their usual flushed ivory. He was pale anyway for a hobbit-gentleman, and that was the Took strain in him, of course. But after carefully watching his serene face, Rosie felt satisfied that he was not ill. When Sam came in, about five o’clock, tired but happy after a good day’s work at Bindbale Wood, he was bearing a bouquet of mallorn blooms for Rosie, freshly picked. By then Frodo had awoken, and appeared in the kitchen doorway while Rosie was apprising Sam of what had happened earlier. A warm and delicious smell of herbs and garlic and steak pervaded the kitchen: she was cooking the evening dinner. 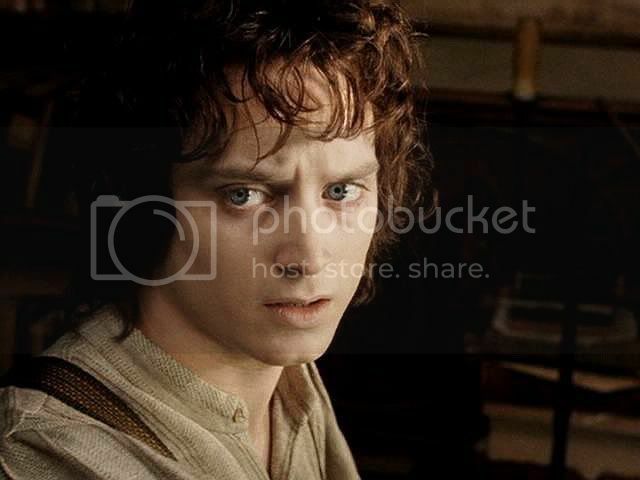 Frodo sat down in one of the kitchen chairs and pushed his dark curls out of his eyes. He gazed at Sam soberly. He would not prevaricate. Sam frowned. His capable hand pressed down on Frodo’s. 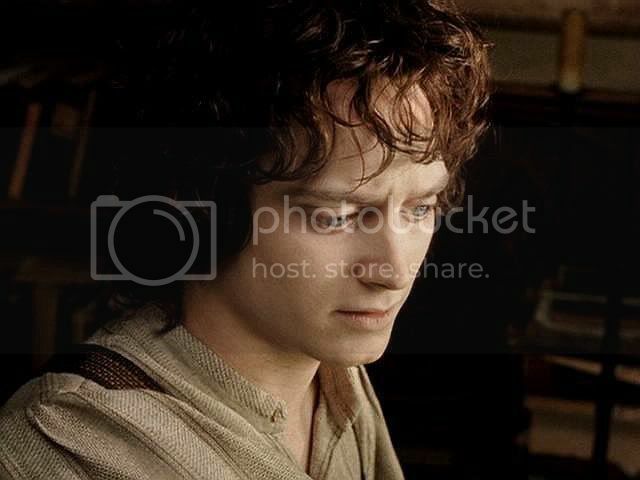 ‘Bad memories, master,’ he said quietly, and his brown eyes were warm and intent upon Frodo. Sam pressed Frodo’s hand again, and kissed his forehead. ‘The evening meal is nearly ready,’ said Rosie softly, watching them. After dinner, Frodo helped Sam wash up, so that Rosie could put her feet up for a bit, and then said he would retire early to bed and read for a bit, most likely. He had smiled at them and bidden them good evening. When Sam and Rosie had gone out to take the night air, there was the sound of rustling pages from the master’s bedroom and a soft golden light under the door. ‘To get over everything that happened on your journey?’ asked Rosie hesitantly. ‘I thought he was mostly writing it for Old Mr Bilbo,’ Sam said, with some wonder. ‘He says he’s writing it for everyone,’ said Rosie. ‘Well, there are some that surely need to read it,’ Sam muttered. ‘And to you, love,’ said Rosie softly. People, in fact, said plenty. As the quietness settled into Mr Frodo more and more, he had ceased to venture much into the village, and he saw few Hobbiton people. It had been noticed. 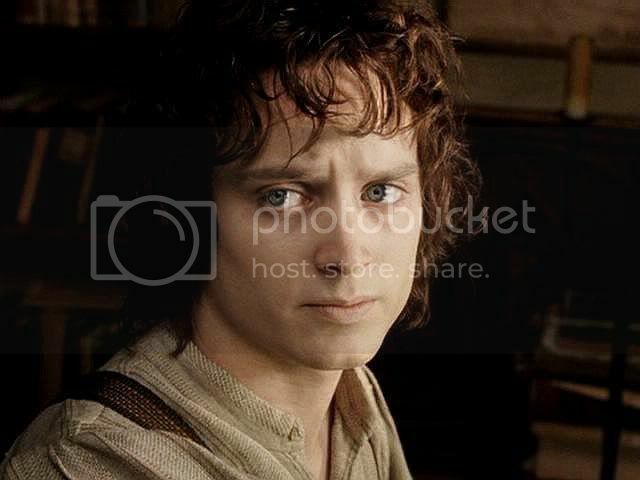 People were all a-gog whenever the two Captains (as they called them), Mr Meriadoc and Mr Peregrin, came riding to Bag End, but it was murmured how queer and silent Mr Frodo had become since he had given up being Deputy Mayor. Turned out just like old Bilbo, he had. Too many books and fancy ideas in his head. Never talked of his adventures. You’d think he’d want to, after all Mr Merry and Mr Pippin and Sam had said, about saving the world and all. (Hobbiton folk were still rather hazy about the exact details of the War of the Ring despite Meriadoc’s patient explanations). But no, he just kept himself locked away. Queer. They shook their heads knowingly. Should have married, really. A nice lass would have steadied him. Always a bit too fey for his own good. A dreamer. It was being Mr Bilbo’s nephew that had done it. And having Brandybuck blood. Takes him off wandering and he comes back not quite all there. Rosie had heard the gossip, and so had Sam. Sam glanced down at her. They made their way gingerly along the garden path, Sam supporting Rosie. ‘Patience, baby Fro,’ said Sam to Rosie's bump. Night had fallen over the faraway hills. It was half past six. The thrush was still singing. 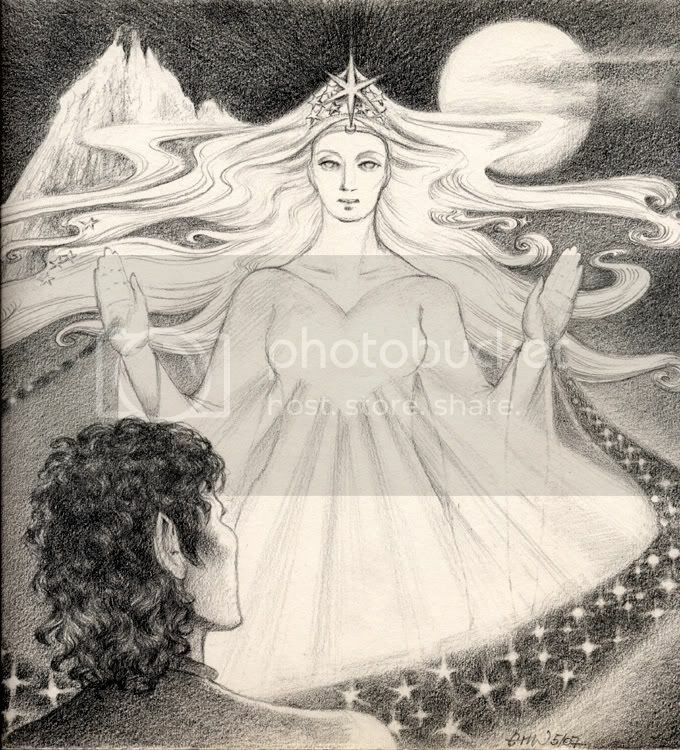 The Evening Star, Eärendil, was twinkling near the horizon. Sam and Rosie went inside. They found Frodo in the Bag End kitchen, busily making himself some scrambled eggs. ‘I’m going to write some more,’ he announced. His face was flushed and his eyes looked bright. ‘Are you sure, Mr Frodo?’ asked Sam doubtfully. His eyes were brilliant – almost feverishly so, Rosie thought. But he was smiling at them as if nothing was wrong. At eight o’clock Sam and Rose retired to bed. Rosie was very tired, and Sam had to be up with the larks the next day: he was seeing Rosie’s father early in the morning about some business down at Cotton’s Farm and then he would be back at Bag End in the afternoon. The sound of Frodo’s pen scratching came from the study. 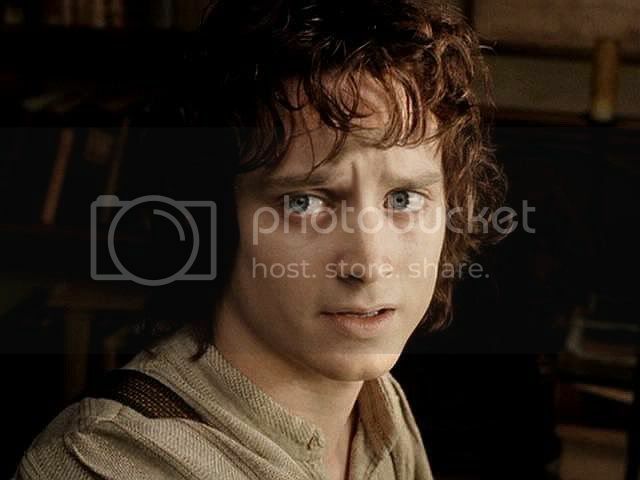 Frodo’s voice sounded perfectly cheerful. Cirith Ungol. The Spider’s Pass. Gollum’s betrayal. Waking up in the Tower, surrounded by orcs. Sam’s rescue. Their entry into Mordor. At midnight, he laid down his fountain pen, slowly and deliberately, upon the desk, and buried his face in his hands, breathing deeply. His hands trembled. He had thought that writing it all out would lance the poison. He had not lied to Rosie and Sam. He was not sick, not in a physical way. No healer in Hobbiton could cure this malady of the soul. What he was suffering from was a surfeit of memory, and a phantom pain which was not real. Slowly and relentlessly, like a huge dark wave approaching to engulf him, the memories were coming, and whether writing them out would help him in the long run, he did not know. 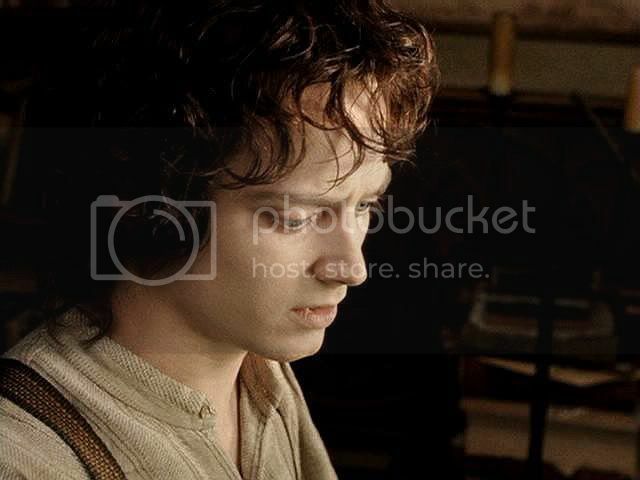 Frodo rose from his desk, feeling weak and dizzy. He closed the Red Book carefully and shuffled his papers together with a shaking hand. He stumbled along the corridor with a night-light. He could hear Rosie’s soft breathing and Sam snoring down the passageway, in their spacious bedroom on the south-eastern side of Bag End. Somehow he made his way down the corridor to his bedroom. He almost fell inside his room, and collapsed on the bed as the great white wave of nausea arrived in full force and swept over him. Frodo’s body convulsed. He groaned out loud and hoped desperately that Sam and Rose would not hear. Sounds carried in the night. March 13th had now turned into March 14th, but the sickness had not abated. It had bided its time all day, and was hitting him hard in the early hours when one feels most alone, most abandoned. The suffocating darkness, the sickening stench, the paralyzing fear … the memories were coming relentlessly and he could not hope to escape them. His teeth clenched and his hands, sharp-knuckled, clawed into the bedclothes. ‘Aiya Eärendil Elenion Ancalima!’ he moaned, but the prayer in the tongue of the High Elves did nothing to alleviate the pain. The phantom pain had awoken. The old wound on his neck, long healed, no more than a scar, a mere ridge of flesh, was throbbing, as if the spider-poison was newly poured into him. It would not avail him to call on Eärendil or Elbereth. The dark wave of memory was coming, and all he could do was ride it, like a ship tossed upon storm-driven waves. He butted his head into the pillow, panting. His curls were slick with sweat, his body trembling rigidly. He was falling into the darkness and there was nothing he could do to prevent it. He had awoken, sick and dazed, to find them all around him. The feral stench of them: the smell of iron and dirt-encrusted leather, the smell of blood, the smell of suspicion and brutality. They had hauled him to his feet, feverish as he was from the spider-poison, jabbing and prodding him with their hard fingers. Their voices were harsh. They uttered Black Speech. Somebody got cuffed by a superior. The same somebody swore, and wiped away blood from their cheek. He closed his eyes and leaned his head back against the wall, feeling sick. Sam, Sam, oh where was Sam? He must not mention Sam. On no account must he mention Sam. Almost without thinking, his hands rose to his throat in a protective gesture before a sharp memory jabbed his brain, making him gasp and drop his hands at once. No, no. For the love of Elbereth, they must not guess what he carried on his person. They must not find the Ring! It was a nightmare. He would wake up soon. Sam would call ‘wake up, Mr Frodo,’ and he would feel Sam’s hand pass gently over his brow, smoothing the curls back. Sam. Sam. Sam, where are you? Are you dead? Hard claws tore at his clothes. He fought back in fury and fear, but above all, fear. The Orcs hooted and yowled as he struggled frantically, twisting and writhing against their brutal clutching hands, but there just seemed to be more and more of the creatures, their numerous claws swarming over his body, forcing him to submit. Numbly he realised that the Orcs had torn every last scrap of clothing from his body. He was naked, exposed, alone, adrift on an icy sea of terror and confusion. Cold air flowed from somewhere over his pale flesh. His head rolled forward as the delirium took control again. There was a sneering laugh. Some were squabbling. He could not remember which orc it was who had first roughly ripped the mithril shirt over his head, snagging some of his curls in its delicate links … he only remembered seeing its soft glittering beauty being passed from claw to foul claw, and the accompanying shrieks and curses. Another voice, deep and snarling. Yes, Shagrat, the Captain of the Tower of Cirith Ungol, had been in charge. 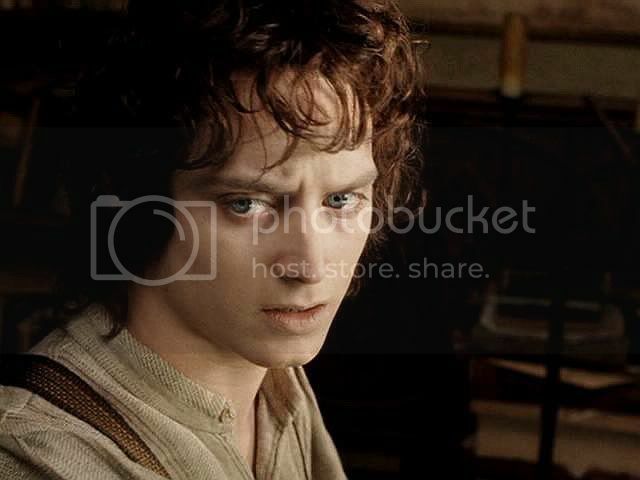 ‘Where are you from?’ he hissed at Frodo. Daggers and eyes, daggers and eyes. Gloating eyes which burned into him. A dagger placed at his throat. The knife-point trailed tauntingly down the length of his naked body. The incredible shock jolted him completely from semi-delirium. Of course. The Ring was no longer round his neck. How could it have been? They had completely stripped him. He stared wildly in front of him, his heart pounding, his horror blinding him to everything else, not even seeing the ugly gloating smiles of the Orc-captains and the cruelty in their eyes. The dreadful loss of the Ring loomed far larger than any distress at being naked and helpless before these vile creatures. When had they taken it? He could not remember them tearing It from his neck when they stripped him. Dear Lady of the Stars … when? They must have taken It while he was still unconscious, when they found him in the tunnel, and bore him to this hellish place. He buried his head in his hands, unable to suppress his anguish. The Orc-captains snarled and one of them struck him brutally across the mouth, splitting his lip. He didn’t care. If the Ring was gone, Sam was dead. They had taken the Ring to Sauron, and the whole world was swallowed up in darkness. All he longed for was death. But he knew they would not allow him to die quickly. Previous screencap entry, "Frodo Returns to Bag End" HERE. 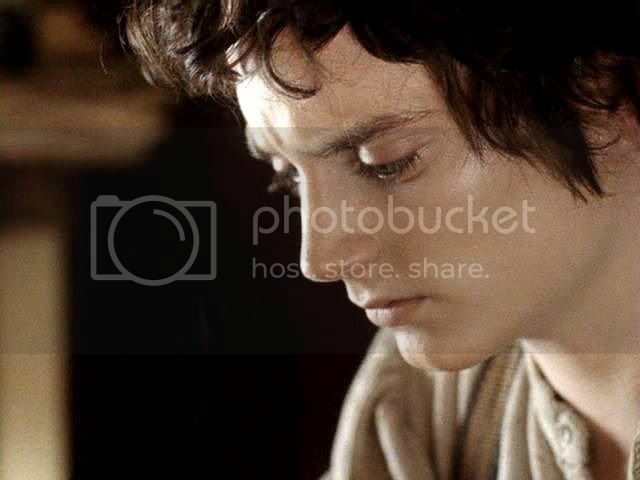 Next screencap entry, "Frodo Writes the Red Book, Part II" with Pt. 2 of "Star fo the Sea" HERE. It's lovely seeing these screencaps of Film Frodo ... here he is so close to my ideas of Book Frodo. Although Film Fro looks younger than his book counterpart, he has an air of patient, mature, resigned melancholy that fits my personal vision of Canon Fro beautifully. Gorgeous, very quiet and so very sad. Thank you for posting, Julchen. 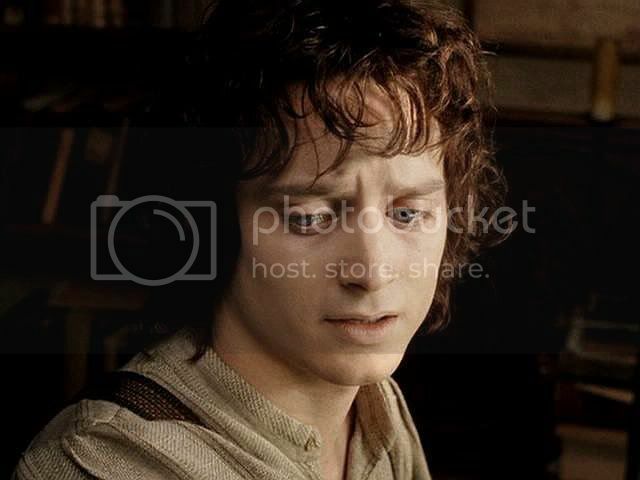 They are two beautiful, moving, lit-from-within Frodos: one in visual images, one in images made of words. I love this story so much. 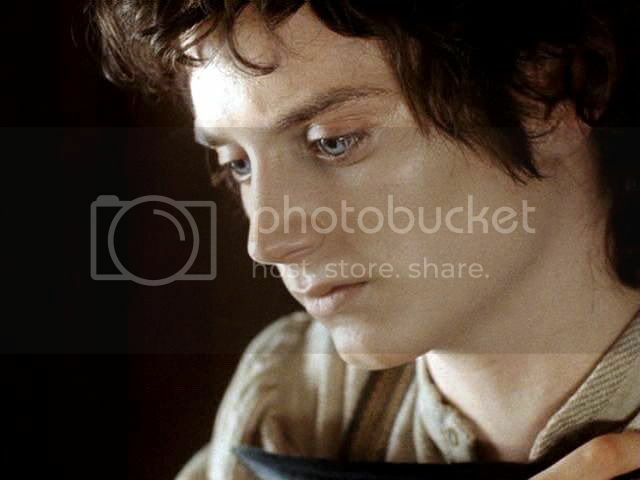 It makes me very weepy, of course, yet more than many fics, and more even than the canon text, it fills me with hope for Frodo's fate in Tol Eressea. Just as all along the Valar have been watching over him, guiding, encouraging, sustaining, consoling, they will do so there, especially, I suspect, Elbereth, who appears to have made herself his special patron. "A star shines on our meeting," she will say to him in the age-old greeting, and it will be true. I have had the pleasure of reading Pearl's beautiful story several times. But that did not prevent me from reading it once again. Pearl's 'Star of the Sea' will always be one of my favourites. Together with your great caps = Pure Magic. Thank you for posting it, Mechtild, and thank you, Pearl, for agreeing to it being posted here. Now on the part two as soon as time allows. I love the way the story looks up there, period. It's such a beauty, I wanted to make a proper showcase for it. As soon as I knew I was going to post all the end scene caps I'd made -- which would include the desk scene -- I had a fantasty of posting this treasured story here. I have one more set of desk scene caps which I will use to go with a Frodo-writing-the-Red-Book poem by Jan. However, I am afraid you readers don't get to see it the way I do. I did hope that getting a paid membership would mean that the formatting didn't drop out once a main entry page is opened to the comments page. It does do this for me at home. But when I look at my LJ from a computer at the library, none of my choices of various styles of older-style font faces I chose is preserved; it only keeps basic size, bold, italic, etc. but in plain, modern Arial face. Boo hoo hoo! It can't ruin the pictures, though. Those pictures meld in perfectly with Pearl's story. Well done! Thanks, Maewyn. Yes, I think I've used 5 or one near it for a manip. In fact I am sure I have. Such a face!